The Arctic Star, a military honour unveiled by the Government of the United Kingdom, is now a recognized military honour in Canada. Eligible Canadian Veterans can wear the medal with other Second World War honours. 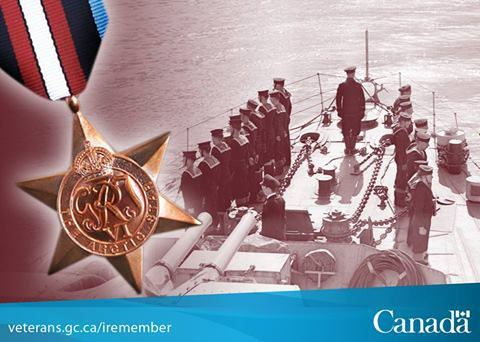 Canadian Second World War Veterans who served for any length north of the Arctic Circle (North of Iceland and east of Greenland toward Russia – Greenland Sea, Norwegian Sea and Barents Sea) from September 3, 1939 to May 8, 1945, are eligible for the Arctic Star. Why does it take the government 69 years to make a decision to wear a medal? Over 3/4 of the veterans from this war have alreadypassed away. I am glad they finally did this, I feel it's way too late, but at least there is recognition, and another Star medal...excellent! A vet at my church was presented his medal by the Lieutenant Governor about three weeks ago ... interestingly the Russian Ambassador presented him an award two years ago. At least it wasn't too late for him. Congrats Jim G. ! I donated the one I had to the Base Borden Museum, it is being framed with the others at this time.